Ah Doubt… Doubt has been my roommate a long time. She’s lived rent-free in my head and really curtailed me from living my dreams. I don’t know why. And I don’t care because I gave her notice, and replaced her with better roommates – belief, positivity, love and success. How does that feel? Thank you for asking! I feel like I’m flying and that everything is possible – and not even possible but definite. Corny? Maybe, yet it’s a true story. Is doubt squatting in your head? Sassy Secret #5: Kick doubt to the curb…let go and embrace your freedom – wheeeee! Come fly with me, let’s fly away — Sinatra APPROVED! 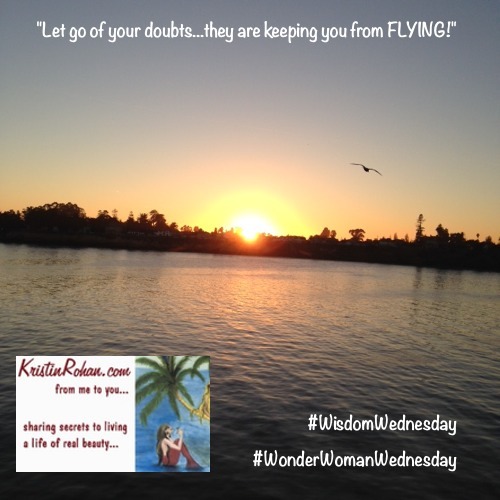 And if you ARE ready to fly with me, drop a line…kristinrohan@gmail.com…I’m here to empower you to live your dreams…learn more about what I’m doing and how I can help your amazing self. Something Green & Sassy — Kristin’s Kocktail #3 Bloody Mary…bloody good! Happy International Women’s Day…to everyone! Copyright © 2007-2019 Kristin Rohan All Rights Reserved.